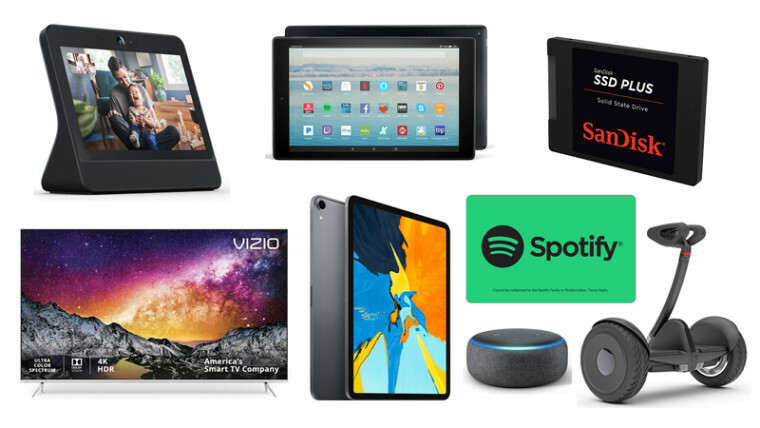 With today&apos;s deals there are discounts of up to $150 on the 11" and 12.9" iPad Pro, the Fire HD 10 got discounted to $100, and the Portal from Facebook is at its lowest price at $99. Also, there&apos;s a rare 10% off $60 and $30 Spotify gift cards courtesy of our partners at TechBargains. $60 Spotify Gift Card (Email Delivery) for $54 ($30 Gift Card for $27) at Walmart. Get a rare 10% discount on $60 and $30 Spotify gift cards. Amazon Fire HD 10 32GB 10.1" Tablet with Special Offers for $99.99 at Amazon (list price $149.99). Save $50 off this 10.1" 1080p tablet from Amazon. Matches its Black Friday price. Apple iPad Pro 256GB 11" WiFi Tablet for $799.99 (64GB for $675) at Amazon (list price $949). Get up to $150 off the 11" iPad Pro in 256GB and 64GB capacities. One of the lowest prices we&apos;ve seen for the iPad Pro. Apple iPad Pro 256GB 12.9" WiFi Tablet for $999.99 (64GB for $850) at Amazon (list price $1149). Similar to the 11" iPad Pro, save $150 off the 256GB and 64GB capacities for the larger 12.9" version. Both contain the newer A12X processor. Facebook Portal 10.1" 720p Smart Camera Display for Video Calling with Built-in Alexa for $99 at Amazon (list price $199). This is the lowest price we&apos;ve seen for the new Portal from Facebook. A great Mother&apos;s Day gift, make easy video calls to your mom. 65" VIZIO P65-F1 4K HDR 120Hz Smart LED HDTV + $250 Dell Gift Card for $999.99 at Dell (list price $1299.99). Effective price is just under $750 assuming you use the eGift card entirely within its 90-day expiration period. SanDisk SSD PLUS 1TB SATA III 2.5" Internal SSD for $99.99 at Amazon (list price $124.99). Great value from a capacity to dollar perspective. Lowest price we&apos;ve seen for this 1TB internal SSD. Today Only: Segway Ninebot S Smart Self Balancing Transporter for $364.99 at Amazon (list price $489). Dual 400W motors allow this Segway to go up to 10 mph, with a range of up to 13.7 miles. Features 10.5 inch pneumatic tires. Amazon Echo Dot 3rd Gen Smart Speaker for $39.99 (3-Pack for $70) at Amazon (list price $49.99). Take $10 off the retail price of the 3rd gen Echo Dot smart speaker, or buy 3 and save $80 off. Amazon Fire TV Stick 4K Streaming Media Player for $39.99 at Amazon (list price $49.99). Save 20% off on this popular 4K streaming media player from Amazon. Includes Alexa Voice Remote. This is just a small selection of the discounts, for more great deals go to TechBargains. Published on Wed, 17 Apr 2019 17:06:01 GMT, © All rights reserved by the publisher.